One would have expected the next logical step, after the sounding rocket missions, would be to fly tethers on experimental, orbital satellites. 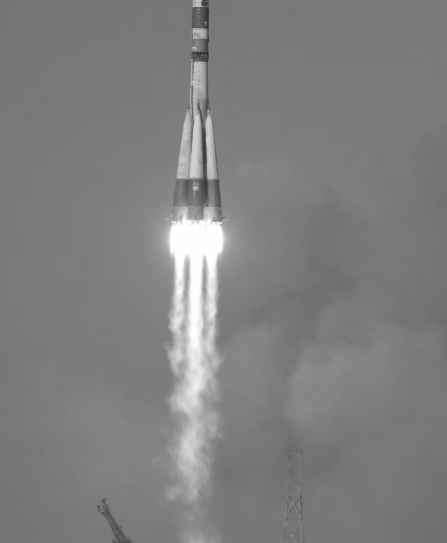 The experiences with the Gemini flights and the various suborbital rockets showed that deploying tethers in space is not a straightforward thing, and that the dynamics involved were not yet fully understood. However, the next tether mission was rather large, complicated, and daring, and involved the Space Shuttle. 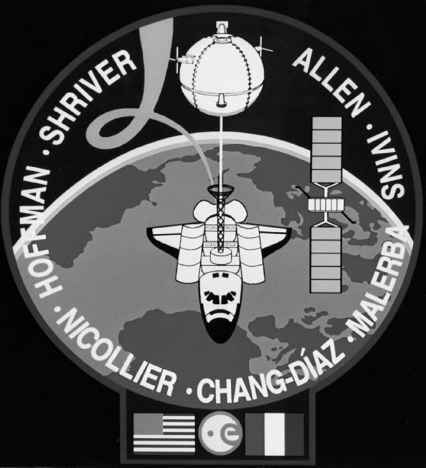 In July and August 1992, shuttle mission STS-46 flew the 518-kg (1142-pound) Tethered Satellite System (TSS), which consisted of a tether deployment and retrieval system, a small tethered satellite, and 22 km (13.7 miles) of conducting tether; 20 km (12.5 miles) of this would be deployed, and the rest would be kept as spare in case the tether would have to be unblocked by further unreeling if jammed on the deployer (Fig. 4.6). pallet inside the shuttle orbiter Atlantis's voluminous cargo bay. It included a 12-meter (39-foot) extendible/retractable boom that would be raised out of the cargo bay to provide a safe clearance between the tethered satellite and the shuttle during the deployment and retrieval operations. An electric motor at the end of the boom would pull tether off the reel. The tether had a diameter of 2.54 millimeters (0.010 inch) and consisted of a braid of 10 copper wires wound around a Nomex string. This was encased in a Teflon sheath for electrical insulation, and then covered with a layer of braided Kevlar for strength, and an outer jacket of braided Nomex for protection against the aggressive atomic oxygen found in the uppermost layers of the atmosphere. The spherical satellite was 1.6 meters (5.2 feet) in diameter and consisted of two parts: an upper hemisphere containing the scientific payload, and a lower hemisphere containing support systems such as electrical power equipment, communications equipment, and a data management subsystem. It also contained a cold gas propulsion subsystem that used nitrogen to control the attitude and movements of the satellite, and that would give the satellite an initial push away from the shuttle to start the deployment. Eight aluminum-alloy panels, covered with electrically conductive paint, formed the outer skin of the satellite. Doors in these panels provided access for servicing the batteries before launch, and windows were installed for charged particle instruments and attitude measurement sensors looking at the sun and Earth. Additional datagathering instruments were mounted in the shuttle's cargo bay and its mid-deck area. Italy developed the satellite and provided five of the 10 scientific payloads needed for the experiment, while NASA was responsible for all other equipment and the overall mission. The idea was to fly the shuttle with its cargo bay facing away from Earth, extend the deployment boom, and then deploy the tether and the small satellite at its end upward. Whether to release the probe up or down was no arbitrary choice, because the direction of motion of a wire through a magnetic field determines which way the electric current is going to flow through it. Due to the flight direction of the Space Shuttle and the direction of the magnetic field lines of Earth (from the South Pole to the North Pole), the flow of electrons through the tether was going to be downward. As the electron collector was built into the released satellite, and the plasma contactor emitting the electrons was positioned on the Space Shuttle, the probe had to be deployed upward. Once separated by some distance with help of the nitrogen thrusters, the small difference in gravity at the location of the shuttle and the satellite (the gravity gradient) would cause the two to be pulled apart and continue the deployment. The gravity-gradient force grows in strength as the distance between the spacecraft increases, so the deployment of the satellite would begin extremely slowly, but then pick up speed to peak at about 6 km per hour (4 miles per hour) 1/ hours after undocking from the shuttle. At this point the satellite would be slightly less than 1/ km (1 mile) away from Atlantis and at a 40-degree angle behind the shuttle. The rate of deployment would then be slowed down briefly, reducing this angle to 5 degrees and putting the satellite almost directly overhead of Atlantis by the time that about 5 km (3 miles) of tether would be unwound. At 6 km (3.7 miles) away from Atlantis, a one-quarter revolution per minute spin would be induced on the satellite by its control thrusters. The slow spin was needed for science operations with the satellite, enabling its sensors to have a good look around. After this, the speed of deployment would be gradually increased, climbing to almost 8 km per hour (5 miles per hour) about 4 hours into the deployment and with the satellite at a distance of about 15 km (9 miles). The speed would then gradually decrease, with the satellite coming to a stop almost 5V2 hours after undocking. It would then be almost 20 km (12.5 miles) away from Atlantis. Just prior to full deployment, the satellite's spin would be stopped briefly to measure tether dynamics, and then a seven-tenths of a revolution-per-minute spin would be imparted to it. The fully deployed cable would then be dragged through Earth's magnetic field for 31 hours to explore the dynamics and electricity-generating capacity of the system. As described before (see Electrodynamic Tethers in Chapter 1), the generation of electricity in this way would also result in a braking force on the Space Shuttle, slowing it down. At the end of the experiment, the tether would be rolled in for retrieval of the satellite. The objectives of the TSS-1 experiment were to verify the performance of the TSS equipment, to study the electromagnetic interaction between the tether and the ambient space plasma, and to investigate the dynamical forces acting upon a tethered satellite. Things did not go according to plan, however. The first attempt to deploy the TSS tether and satellite was soon aborted by the crew members when they saw that the satellite was moving excessively side to side. They then quickly checked the status of the tether reel and the cold gas control thrusters, and made a second attempt a minute later. Initially the deployment was now going smoothly, but a minute later, when unreeled to a length of 179 meters (587 feet), the tether became blocked. It was thought that the cable had gotten stuck on the reel, maybe due to buried winding, so the tether was reeled in some 5 meters (16 feet) and then deployed at a somewhat higher rate. Unfortunately, at a length of256 meters (827 feet) the satellite stopped once again (Fig. 4.7). After some investigations, deployment activities were resumed about 1V2 hours later. The cable was only reeled out about a meter further before the system stalled again. It was then decided to call it a day, power down the satellite to survival levels (to prevent draining the batteries), and give the crew a rest. Thirteen hours later the satellite was reeled in to a tether length of 224 meters (733 feet), where the cable jammed once again. This time the astronauts were unable to move the tether in either direction. which was believed to be in the upper or the lower tether control mechanism. It was decided that if the block could be cleared, the satellite would be brought back in and secured in the cargo bay. Seven hours later the deployment boom was retracted a short distance, allowing the crew to visually check for a tether block inside the boom structure. The crew did not see anything amiss there, which meant that the jam had to be somewhere at the upper tether control mechanism located below the structure. The boom was then reextended with the reel brakes engaged, effectively stretching the tether in the hope of clearing it from any slack. The plan worked, and the satellite was successfully retrieved and docked at the top of the boom. The boom was then retracted, stowing the TSS system for the flight back to Earth. Clearly a redesign of the TSS was needed. The system got another flight opportunity during shuttle mission STS-75 with orbiter Columbia, which was launched in February 1996. On February 25, the satellite of TSS-R (R stands for reflight) was deployed. This time mile after mile of tether was rolled off without any problems, and the electrical current through the tether grew with the increasing length, just as predicted. Then, close to full deployment with 19.7 km (12.2 miles) of tether unreeled, the tether suddenly broke near the deployment mechanism. The free end with the attached satellite, which was still in radio contact with the shuttle, snaked away into space. Finding out what had happened was not easy. Recorded measurements of the stress in the cable showed that it was as predicted and within limits when the tether broke; the break was thus not caused by a too heavy pull. Fortunately, the shuttle returned the remaining length of tether back to Earth, so that it could be thoroughly investigated. When the frayed end was examined, it was discovered that an electric current had melted the tether. Tests in vacuum chambers on Earth showed what had probably happened. One very likely cause of the problem was found to be the innermost core of the tether, around which the copper wires were braided. This core was made of Nomex, a porous nylon material. During the manufacturing process, small bubbles of air at normal atmospheric pressure got trapped inside the material. In the vacuum of space, this air may have leaked out and been converted into a plasma by the high voltage of about 3500 volts in the tether (similar to what happens when you turn on a neon light tube). A plasma consists of negatively charged free electrons and the remains of the atoms from which these electrons were ripped away by the voltage, which are thus positively charged. Moreover, the density of the plasma would have been relatively high, turning it into a very good electrical conductor. Plasma bubbling away through tiny pinholes in the insulation layer could thus have resulted in an electrical current going through the plasma rather than the copper wires. Another cause of an electrical arc on the tether could have been a breach in the insulation, caused by debris in or on the cable damaging the tether when it was wound onto the reel before flight. Later investigations did find various contaminating particles inside the tether as well as in the deployer mechanism. The current flowing through the electric arc had a strength of about 1 ampere, enough to burn away most of the Kevlar at the location of the break. As a result, the tether lost strength and broke due to a pulling force between the satellite and the shuttle orbiter. Although the experiment is often seen as an expensive failure, much scientific data had already been collected by the time the tether broke. Also, unlike during the first TSS flight, the deployment had been nearly completed without difficulty. All experiments on the satellite and the Space Shuttle worked and recorded data, and the electron guns used to eject the tether current back into the ionosphere from the orbiter worked well. Data was collected on the charged particle environment of Columbia's cargo bay, as well as on the effects of the shuttle thruster firings and water dumps on the tether and satellite. The experiment has led to important improvements in our understanding of tether dynamics. The free-flying tether, reflecting light from the Sun, was visible from Earth. Many pictures were made, some clearly showing the satellite as a point of light at one end of the cable. 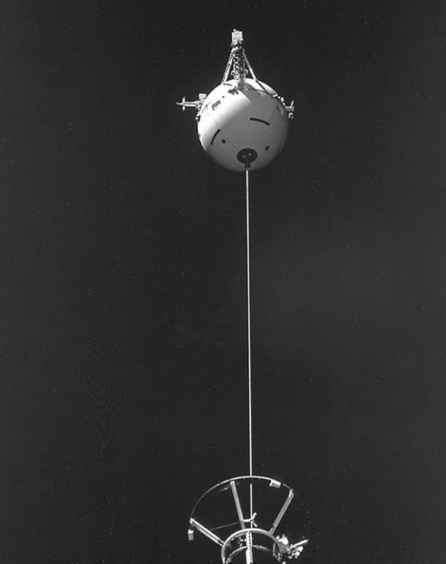 Most observers reported that the tether seemed to be hanging below the satellite in a roughly vertical position, indicating that the tether had automatically achieved a gravity-gradient stabilized attitude (Fig. 4.8). The experiment also inadvertently demonstrated the momentum transfer principle: when the tether severed, both the satellite and the shuttle moved into new, elliptical orbits. The change in the shuttle's orbit, however, was tiny due to the small mass of the satellite (68 kg [150 pounds]) in comparison to that of the shuttle orbiter Columbia (119,000 kg [262,000 pounds]).